If you are considering having your wisdom teeth removed, the term impaction may be popping up in your research. But, what exactly is impaction? Impaction refers to wisdom teeth that are unable to properly erupt into the mouth. In an ideal wisdom teeth eruption, the teeth would erupt entirely from the jaw in a straight manner, causing no overcrowding or damage to the surrounding teeth. This rarely happens, however, and usually one or all the wisdom teeth may be partially or fully impacted. Impaction can occur in one of three ways. The first way is called soft tissue impaction and describes a case where the gum tissue cannot pull back from the tooth. The second way is called partial bony extraction and occurs when a tooth is partially erupted, but without proper function. The third and final way is called bony impaction which describes when the tooth does not erupt and instead stays within the jaw bone. It is easy to notice an impacted tooth simply by the way it grows. 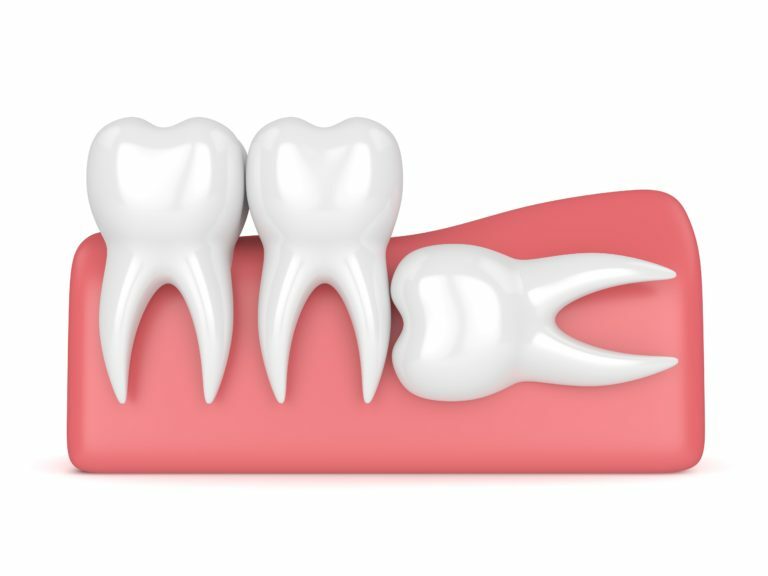 Any tooth growing at an angle towards other teeth or away from other teeth is partially impacted. Similarly, if the tooth is growing sideways in the gum, this is also an indication of impaction. Finally, teeth that have come in straight, but not completely are also considered impacted. It is important to have your dental team at Alameda Dental Group asses possible impactions. At your appointment, they will perform an oral exam and will most likely do x-rays to look below the surface and determine the severity of the impaction. Once the exam and x-rays are complete, they will discuss your options with you and together you can decide on the best course of action. More times than not, your dentist will recommend that impacted wisdom teeth be extracted. Extraction allows your existing teeth to remain healthy and prevents them from suffering damage caused by overcrowding. Although many people don’t wish to undergo an extraction, this is the easiest way to prevent further complications with more severe treatments. Most likely your dentist will refer you to an oral and maxillofacial surgeon, which is a dental specialist in the bones of the face. These dental specialist are trained in surgery and dental arts, so they are highly qualified in their ability to remove wisdom teeth quickly, safely, and effectively. Your surgeon will put you under local anesthesia during the procedure, so you will not feel anything. Most patients have no recollection of the procedure due to anesthesia, however a few do repot feeling pressure, but never pain. If you are anxious about this, you can ask your doctor to use the strongest amount of sedation possible. The procedure is very quick, approximately only 30 minutes. After your procedure, you will be able to go home as soon as the anesthesia wears off. You may experience some swelling and bruising for a few days, but this will fade. Once you have recovered from the extraction, which usually takes about 1-2 weeks, you will have no more problems caused by your wisdom teeth and it will be like it never even happened.